A heck of a lot of A-League players will be looking for a good lie down and a few days rest after a hectic three weeks of football. From this point forward the A-League moves back into its more normal scheduling arrangements, as the holiday period comes to an end. Here are the men that made the difference in a weekend where the favourites confirmed their finals credentials. 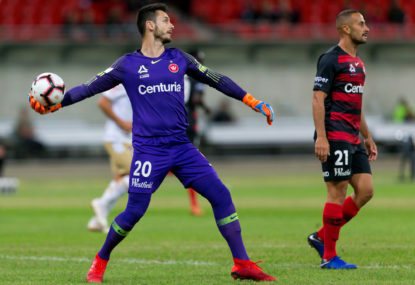 After a first half where the 25 year-old goalkeeper was more chance of picking his nose than picking the ball out of the back of the net, he came to life in the second as Melbourne City attacked in waves. Warren Joyce’s words obviously hit home and the visitors were a different side after the interval with Kurto saving four realistic chances that looked likely to get the match back on even terms. In the end, the Pole stood firm and City scratched their heads at a goal keeping performance that denied them a point. The 18 year-old, yes 18, makes his first appearance in the team of the week after a brilliant display against City on Saturday night. Over-lapping runs on the left were at the core of his performance, along with his normal stoic and mature defending that belies his age. The Phoenix have an absolute champion on their hands in the shape of young Cacace and if managed well, could have an internationally bound young star. When Melbourne City did let rip in the second half against the Phoenix, there was a great deal of work to be done at the back. Much of it was ugly and scrappy, yet if there is one man in the competition who appears to thrive in that role it is Taylor. Hacking balls clear, grappling shoulder to shoulder with defenders and playing thumping headers to relieve danger all appear as innate skills to the Englishman and he was once again at his best in another Phoenix victory. 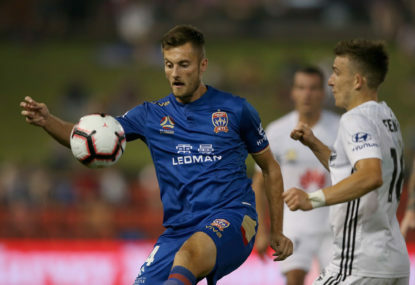 I wrote in the pre-season about the potential improvement in Delbridge under the watchful eye of Bart Schenkeveld and Saturday night was a prime example of the steps he has made as a defender. Wellington were well on top for much of the contest and deserved at least a point. Without Delbridge’s excellent timing and composure, as he was stretched wide in defence, the score could have been doubled or even tripled by half time. It is great to see a young Australian defender working hard and putting his name in the frame for a Socceroo opportunity in the coming years. In what evolved into a ripping ‘big blue’, Zullo was superb in a losing side. Huffing and puffing down the left side, the 30 year-old fired ball after ball into the box, waiting for a sympathetic Sydney head to meet his service. 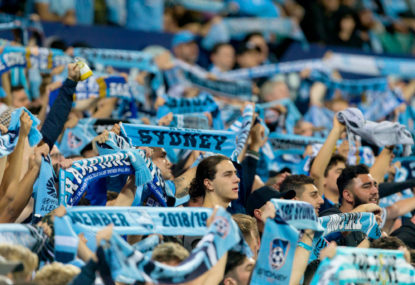 Sadly for the Sky Blues, it was not to be their night and the Victory etched another victim on their belt for season 2018-19. Quite fittingly, on a weekend where people officially adopt Australia as their home, the recently nationalised Isaias produced a second half masterclass against the Mariners that pulled back a 0-1 half-time deficit. The little champion found the first goal for the home side and produced a collection of beautifully timed passes that helped create the space for Adelaide to threaten the Central Coast defence. That space eventually produced the winning header from George Blackwood. It is a good thing that Warren Joyce got rid of Kilkenny a few years back, his value to City was seriously questionable! My goodness has the English born midfielder taken that rejection in the best way possible. With the obvious support of Tony Popovic, Kilkenny has become a key component in the Kilkenny/Castro/Keogh triad and produced another outstanding display in the west to destroy another hopeful road trip for the Jets. 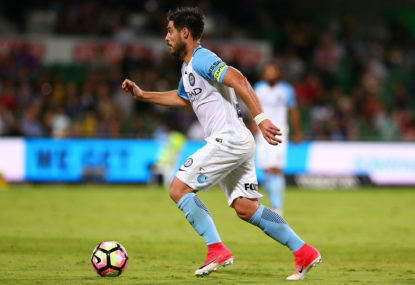 As Sydney FC quietly rolled along collecting wins in recent weeks, Ninkovic played less of a role than we have come to expect. The Serb still looked in good form yet wasn’t producing the mastery of his Johnny Warren Medal winning season of two years ago. 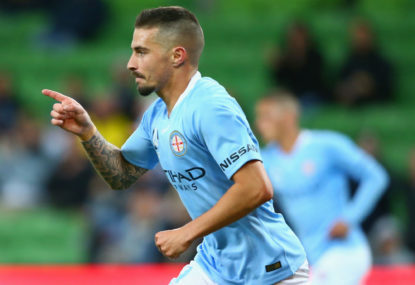 After Victory took him well and truly out of the game with some astute defending in the first half on Saturday night, the little magician came to life in the second and had Sydney all bar level when the final whistle blew. It was a brilliant performance in a losing team and his goal topped of what was a return to something near his best form. As monotonous as it may seem, week after week the big Swede continues to produce the astonishing. 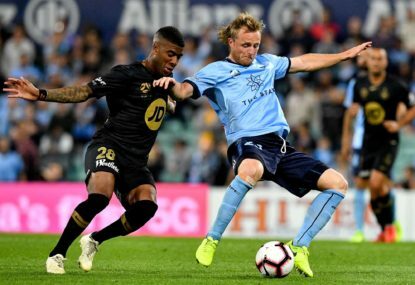 In another quality performance from, quite frankly, the most impressive player in the A-League, Toivonen decided to put any doubt about that fact to bed with a stunning goal. 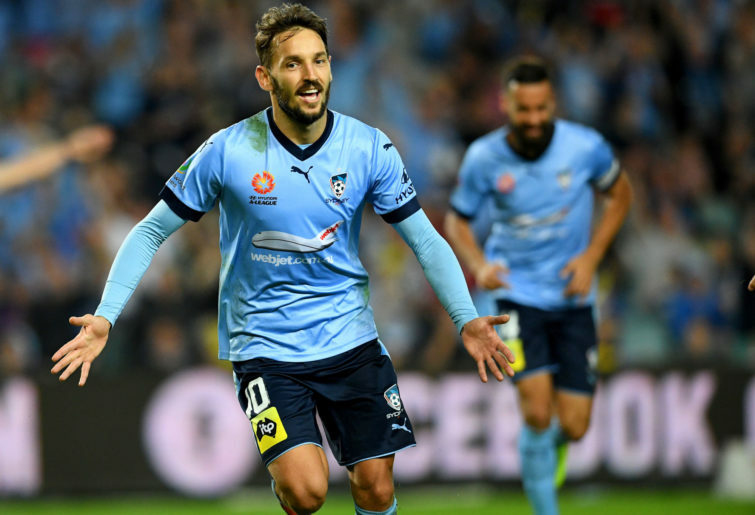 An exquisite set piece left Andrew Redmayne without a hope in Hades as the Victory completed another win over the Sky Blues and firmed as favourites for all the A-League silverware on offer. After a second week of self-destruction where the Wanderers threw away two points with the finish line well within sight, Bonevacia was the shining light in the visitors attack. Despite Roar’s two late goals, the Dutchman played a vital role in setting up the seemingly comfortable and match winning lead that the Wanderers enjoyed before calamity struck. His goal to open the scoring was exquisite skill, despite some questionable defending and Bonevacia provided a constant threat to the Roar defence throughout the match. What Adelaide United and Melbourne City would give to have a man like Keogh as a central focus up front? The Glory enjoy such a luxury with the Irishman producing another sublime performance against the Jets in the west. His opening goal was provided by his little mate Diego Castro, yet Keogh’s ability to position himself in the perfect spot for a number nine has been the fundamental reasoning behind an A-League career yield that is fast approaching 50 goals. He was at his best against Newcastle and a constant threat.